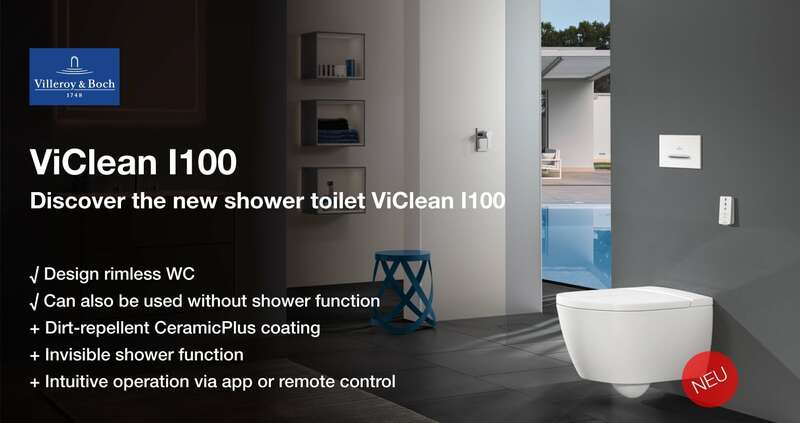 The renowned manufacturer Villeroy & Boch is taking the sanitary sector one step ahead with the innovative ViClean I100. A quality product, which combines the highest level of comfort with a simple appearance and the very latest technology for shower-toilet resulting in a stylish and ultra-modern design. At a first glance it might look like a normal WC but under the elegant appearance an innovative paperless use shower-toilet is hidden. The technically sophisticated shower arm and the shower jet for cleaning the intimate part can be regulated and controlled according to the user's personal needs. An automatic nozzle cleaning after using the toilet reliably ensures the desired hygiene in and on the toilet. The ViClean I100 combines functionality, quality and sophisticated aesthetics in a harmonious way. The German manufacturer of high-quality ceramics, headquartered in Mettlach in Saarland, also likes to break new ground in the field of sanitary, bath and toilet. When it comes to prioritizing the company does it not prioritize on functionality and design but they also think on quality and they proof this by keeping the production of the items in Europe. This basic setting also characterizes the high quality of the ViClean I100. Villeroy & Boch attaches great importance to technically mature and durable materials to this extraordinary hygienic toilet, which underline the class of this pioneering product in a targeted combination. The toilet bowl itself is made entirely of high-quality ceramic, the seat is made of durable and easy-care Duroplast and the shower nozzle cover is made of Quaryl®. When it comes to sanitary ceramics for the innovative hygienic toilet, the renowned manufacturer relies on its many years of experience with this material to ensure quality in the top segment. The natural raw materials clay and kaolin as well as fine-grained quartz and feldspar, together with other materials and the glaze, form a harmonious combination in the processing stages. The result is a high-quality and at the same time very robust and easy-care sanitary ceramics of the highest quality class with an even and noble shiny surface for the toilet bowl. The Duroplast used to produce the comfortable and robust toilet seat is of extreme durability. This high-quality plastic is durable and can withstand even heavy use by users with a wide variety of body sizes permanently and reliably. The Quaryl® used for the shower nozzle cover is a UV-resistant plastic which is also very durable and easy to clean. All these well-thought-out components make this ultra-modern and a lasting value hygienic toilet so attractive for users with high standards of hygiene, comfort and aesthetics in the sanitary sector. A shower toilet is an almost revolutionary solution for the completely paper-free toilet. In principle, it is a clever, space-saving and contemporary mixed form of a conventional toilet with water flushing and a bidet. Classically, a water closet is used for the collection and residue-free removal of residues when going to the toilet. The user sits comfortably on a toilet seat, while the ceramic toilet bowl acts as a collecting basin. The residues are removed by means of water power used for flushing the toilet and the intimate area is cleaned with toilet paper in conventional toilets. If necessary, a bidet is sometimes installed separately from the toilet in the sanitary room. The intimate area is cleaned with the help of water. The bidet is lower than the classic toilet bowl and is also known as the seat washbasin. Because of their design and function, bidets are always installed separately from the actual toilet on the toilet or in the bathroom and they require a corresponding amount of space in the sanitary room. Due to its design, a bidet can only be used for personal hygiene in the genital area and not for the disposal of excreta. On the other hand, the classic toilet only allows the hygienically perfect removal of liquid and solid excreta, the cleaning of the intimate area must still be done with toilet paper. An innovative shower toilet combines functions and advantages of both sanitary facilities and allows the removal of residues as well as the cleaning of the intimate area with the help of water in one session. The installation of a separate bidet is therefore completely unnecessary. For this reason, the term toilet bidet is occasionally used for such a sanitary system, also known as washlet. Washlets have so far been popular worldwide, particularly in Asia and Japan, and in Europe, especially in Switzerland. Villeroy & Boch is more revolutionary in Germany, taking giant steps into the sanitary future with its clever thought-out yet amazingly simple details in a contemporary toilet bidet. The ViClean I100 is an integrated model in which connection cables and technology are extremely clever, space-saving and virtually invisible in the ceramic. The technical comfort is very important for manufacturer. The individually adjustable HarmonicWave technology ensures that the water gently flows around the front and back intimate areas. In addition to hygienically perfect cleanliness, it provides a wonderfully refreshing vitality boost. The water jet can be comfortably individually adjusted, and the peculiarities of the female and male anatomy meet the groundbreaking technique: in addition to a buttocks shower, this multifaceted toilet has a lady shower specially designed for cleaning the female genital area. Even the temperature, which is perceived as pleasant, can be adjusted individually; the strength of the water jet can be configured as desired. Overall, the position of the shower arm in the toilet can be adjusted to five different settings. Since only pure and clear water without any chemical additives is used to clean the intimate area, this hygienic toilet is also suitable for allergy sufferers. The technical comfort of this cleverly designed toilet bidet of the latest generation is particularly fully developed and user-friendly. Thanks to the remote control and SoftClosing function, the model is soft, gentle, quiet and extremely comfortable to handle. An individual user profile can even be configured via an app on a tablet or smartphone. Eye and nose also get their money's worth with this hygienic toilet, which gently treats all senses: thanks to the DirectFlush function, rapid and effective flushing without unpleasant odors and the rimless design makes cleaning the toilet easier and at the same time it is balanced and aesthetic in design. The rimless washdown-WC with integrated shower function and DirectFlush function is made of high-quality sanitary porcelain CeramicPlus and has the dimensions 385 x 595 x 400 mm. The integrated AQUAREDUCT® water-saving system ensures a low flushing water consumption of 3/4.5 liters. The fixing set for the power and water connection position in conjunction with ViConnect is included in the scope of delivery. With the ViClean I100, you can rely on the comfort of the future in your sanitary area.